I arrived today from Brussels, where the mood in the Eurobubble has changed substantially in the last few months. Everyone – politicians, diplomats, eurocrats – has their eyes fixed on the European elections of May 2014. I wouldn’t say there is something of a campaign fever in the air, there is definitely fever in the air though, but more the traditional one. People in Europe’s unofficial capital are so much focused on the next elections, because so much is at stake. There will be no treaty on the table, nor dramatic enlargement plans. The elephant in the room is us. We, the European people, more than 500 million of them, and we are rapidly losing trust in the EU. Trust figures are really collapsing. You probably know the figures but I’ll just name a few: in the Netherlands trust in the EU has gone down from 50 to 28%, in just five years. Even pro European countries like Spain and Italy are quickly disengaging from the EU. In Spain the proportion of pro-Europeans has dropped from 80 to 46%. This negative climate is only reinforced by the rise of populist parties who now literally team up to form an anti-Europe bloc during the next elections. The Economist calls it the rise of euroscepticism, but I would argue that parties like Front National, PVV and UKIP want to rip the European Union apart and destroy its institutions. Nothing eurosceptic about their goals: it is blunt eurotrashing, a direct attack on – what they call it – the EUSSR. We are more than seven months from election time, but my estimate is that these parties could easily get ten to twenty percent of the seats in the European Parliament. Already in polls Front National and PVV come out as the biggest party in their home countries. People are fed up with the EU, the payments to the South or the strict rules of the North. They are fed up with unemployment, piles of debt and political crises at home. No wonder people are susceptible to politicians who argue that the current situation is the fault of Brussels and that we should reverse the integration process. So expect very tough fights and debates in the member states in the coming years. But we are not here to discuss politics, but to discuss institutions and especially the European ones. Are they indeed failing? Why is their legitimacy dropping so fast? Do people actually still believe in Europe? Let me break down my answer in three parts. First the general crisis of institutions, secondly the specific problems of the EU, and lastly I will play out the generation card. As everyone in this audience knows, organizations dependent on large audiences or markets have trouble keeping people connected. Institutes like big companies, governments, labour unions and political organizations have lost their natural (20th century) legitimacy in an increasingly ‘flat world’. Therefore new ways of engagement are on the rise. Citizens increasingly choose to engage online and individually, instead of going to meetings and committees. They burn down company reputations on social media in a matter of hours, but are also ready to cooperate with them to create new products and services. This is because people want to get controlover everything in their life. In an era of information overflow we don’t believe advertisements and political pamflets that are thrown at us. We question doctors and other specialists who give us (medical) advice and prescriptions. We loathe European leaders who say they are at the service of the citizens. That is because these kind of communications are top-down and do not permit real involvement. European leaders can only contain the current economic crisis, not solve it, despite the optimistic words of Francois Hollande. The problems are still paramount: no growth, high unemployment, rising debt levels, zombie banks. It has become clear that there is a big institutional gap in the EU’s governance, above all when it comes to steering the eurozone. The argument is well known: Europe’s leaders did manage to set up a monetary union without the accompanying political union. Since 2010 they had to repair the damage and expand the EU’s powers. The Commission can now directly enforce budget cuts in certain member states. The banking union will slowly but definitely be rolled out. More drastic measures will follow. But the eurozone governance crisis does not sufficiently explain the current legitimacy crisis. I think the disconnectbetween the European political layer and the half billion citizens must be another crucial factor. In the last twenty years we have experienced a drastic expansion and deepening of the European Union. But a sound national political discussion on the expansion has remained absent in many member states, leading to an audience that basically doesn’t have a clue what happens in Brussels, Luxembourg and Strasbourg. Also the European decision-making process is quite difficult and almost impossible to fit in journalistic reporting, even in quality newspapers. Previously I was a journalist and I couldn’t write about the different roles of the Commisison, the Council or the Parliament. ‘Let’s simply call it ‘Brussels’ would be the response of my editor, thereby basically skipping the entire political dynamics that are so typical of the EU. Because sound knowledge of the EU also lacks at many national parliaments, we are in the situation that the Union fails to gather a lot of ‘input legitimacy’. Therefor it focuses quite heavily on ‘output legitimacy.’ The countless studies on the benefits of European integration are part of this strategy, as well as the yearly lowering of roaming rates for mobile phones, the cheers on low air travel costs and the free movement of people. Commissioners have an account on social media, especially on Twitter, and in 2012 the European Citizens’ Initiative was launched: 1 million citizens can ask the European Commission to bring forward proposals. The problem is that the European Union is not here to do nice things for citizens. It is nota consumer organization, but a highly political institute which deals directly with many issues of our daily lives. It has to balance countless interests and take tough decisions. And all this without a proper ‘demos’ of European citizens. As the crisis pushes for deeper integration, the whole system now backfires. People push back and start to blame Europe, instead of praising its necessity and its many advantages. After these rather harsh and kind-of fundamental issues and problems, I now come to a more optimistic angle to the governance crisis: the next generation of Europeans. The facts are frightening. We have 5,5 million young unemployed (aged under 24), and half of the young job-seekers in southern Europe fail to succeed in getting employment. Another 7.5 million are ‘NEETs’: not in education, employment or training. The direct costs of this inertness are estimated at 153 billion euros. But the social price for this waste of human capital is much higher. I believe that the next generation has to be part of the solution to the current crisis. In short: young people are more pro-European than older generations, they are not fearful of a borderless world but see it as an opportunity, are more entrepreneurial and less concerned about losing securities. There is a real generation gap in this matter, for instance in the UK: two-thirds of the young Britons want their country to stay in the EU, while two-thirds of the babyboomer Brits want to get out ASAP. I am starting up a think-tank in Brussels called The Next Generation for Europe to address this gap, but also to point out the many opportunities we have if we engage young Europeans more structurally. In a continent where everyone is turning their backs on Brussels, we really need them. But what Europe’s leaders do isn’t particularly helpful. Still it is basically impossible to bring your social rights to another EU member state. 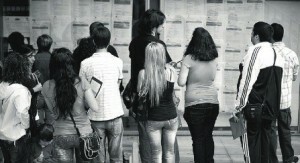 The much heralded Youth Guarantee Scheme will not be more than a drop in the ocean. And worst of all: the EU is spending its one trillion euro budget for the period 2014-2020 on the past instead of the future, killing the funds for digitizing and connecting Europe, and maintaining the agricultural policies. Ladies and gentlemen, the institutions of the European Union are in serious trouble. We may live in the heydays of European integration, but I hope this assumption does not become reality. I don’t think the EU is necessary, I believe in it. I reject the notion that we can’t survive without an integrated Europe, I think it is a goal we should keep striving for and dreaming of. Sinds begin 2013 ben ik als freelance correspondent gevestigd in Brussel, de onofficiële hoofdstad van Europa. Hier zijn de belangrijkste instituten van de Europese Unie gevestigd: het Parlement, de Commissie en de Raad. Deze gebouwen stralen een rare mix van grootstatigheid, machteloosheid, ‘wordingsgeschiedenis’ en disconnectie uit. Neem nu het bombastische Berlaymont-complex (24.000 m2), waar een groot deel van de Commissie huisvest. Het oogt nogal vijandig met zijn duizenden glaspanelen, terwijl een enorme advertentie aan de zijkant tegen je schreeuwt dat Europa er voor JOU is. Er tegenover rijst het nieuwe Ei (of de Vaas) op, waar straks de President van de Europese Raad (de verzameling van nationale regeringsleiders) zetelt. Een project van een paar honderd miljoen euro, besloten in 2004, maar uitgevoerd in tijden van bezuinigingen. Vooral bij het Europees Parlement, net achter de Wetstraat en hoog uittorend boven het Leopoldpark, wordt het dubbele gezicht van de EU duidelijk. De façade oogt streng met spiegelend glas en grenst aan een leeg, onvriendelijk plein. Maar toch proberen Europese politici je weer te verleiden. Grote televisieschermen vol EU-propaganda laten zien hoe fantastisch het Parlement wel niet is, en de argeloze bezoeker wordt letterlijk omringd door een litanie aan grote posters van historische gebeurtenissen in Europa. Van Auschwitz tot de val van de Muur, van toezicht op verkiezingen tot (verrassing) de overhandiging van de oorkonde van de Nobelprijs voor de Vrede in 2012. Van dit gemengde beeld in de Brusselse Europawijk kunnen we rechtstreeks een lijn trekken naar de perceptie van de EU in Nederland. Ook hier zijn we in verwarring. Neem nu de politiek. Is Europa een superstaat? Nee, zeggen de meeste partijen, maar wel moeten taken terug naar het nationale niveau en is ‘Brussel’ hoogst verdacht. De burger is nog steeds massaal voorstander van Europese samenwerking, maar stemde net zo massaal een Europese Grondwet weg in het beruchte referendum in 2005. En als we inzoomen op de media, gebeurt er iets geks. De journalistiek kan helpen de tweeslachtigheid richting Europa weg te nemen, door als onafhankelijke bron van nieuws en duiding de juiste context van de Europese Unie te geven. Maar dat doet ze helemaal niet. Nederlandse media geven maar een heel beperkt deel van de realiteit weer die de EU is. Ons beeld van Europa wordt daardoor vervormd – en de politieke analyse van onze positie binnen de EU zwaar vertroebeld. Hoe komt dat? En waarom is het verhaal dan vertroebeld? Europa is immers voortdurend in het nieuws, zou je toch denken, zeker sinds de eurocrisis in alle hevigheid is losgebarsten. Tijdens de reguliere crisistoppen zien we op het journaal de glimmende gebouwen langskomen en horen we quotes van de regeringsleiders. We kunnen smakelijke verhalen lezen over ‘onze’ minister van Financiën, die als president van de eurozone-groep domme maar ware dingen zegt over Cyprus en daarna internationaal wordt afgebrand. Premier Rutte kan met trots verkondigen dat hij na een zware strijd – ‘met een geladen pistool op zak’ – de korting op de Nederlandse bijdrage aan het EU-budget heeft binnengehaald. Als er nog tijd over is voor Europanieuws, komt een reportage langs over jeugdwerkloosheid in Spanje, Portugal of Griekenland. Deze verslaggeving over het bestrijden van de eurocrisis is goed en noodzakelijk. Maar het werk van de Unie verdient een veel bredere en inhoudelijkere journalistiek, en die ontbreekt in grote mate. Elke week weer missen we een enorme hoeveelheid aan nieuwe Europese regels, afspraken en politieke discussies die voor Nederland uiterst relevant zijn. Hieruit valt een groot deel van de huidige maatschappelijke en politieke onvrede over de EU te verklaren. Het vertrouwen in de Europese instellingen daalt de laatste jaren snel, politieke partijen hebben een halfslachtig EU-beleid of eisen per motie stopzetting van soevereiniteitsoverdracht. Een recent voorbeeld van Europees nieuws maakt deze scheve schaats duidelijk. In maart bereikten de regeringsleiders een moeilijke deal over het nieuwe Europese budget voor de komende zeven jaar, waar 960 miljard euro mee gemoeid is. Dit bedrag is bijna vier maal de nationale rijksbegroting. In de media ging het vooral over de Nederlandse korting aan dat enorme budget. Maar als het EP zijn zegen geeft aan deze nieuwe begroting, waar gaat het geld – ons geld – dan naar toe? In de verslaggeving zag ik, ten tijde van het gesteggel, maar weinig terug over deze hamvraag. De meeste media kwamen niet verder dan het vermelden van landbouwfondsen, salarissen van eurocraten, en de maandelijkse verhuizing van het EP tussen Brussel en Straatsburg. Daarbij misten ze tal van belangrijke punten. Zo heeft Nederland juist belang bij het landbouwgeld (in 2012 kregen we hiervan bijna een miljard euro) en bij de huidige onderzoeksprogramma’s (universiteiten slepen jaarlijks tientallen miljoenen EU-onderzoeksgeld binnen). Verder is Brussel allesbehalve een geldverslindend monster: dit is echt een mythe. De administratie, inclusief Brussel-Straatsburg v.v., neemt slechts zes procent van de begroting op. Liefst negentig procent van het geld wordt direct in de lidstaten uitgegeven. Over de hervorming van het EU-budget heeft een intens politiek debat plaatsgevonden, zowel in het Europees Parlement (waar het nog steeds loopt) als in de meeste lidstaten, maar ook daar kregen we vrij weinig van mee. De landbouwgelden en de ‘cohesiefondsen’ (voor arme regio’s in lidstaten) stonden ter discussie maar zijn zo goed als behouden. Slachtoffers van het nieuwe budget zijn onder meer investeringen in R&D en ontwikkeling van de digitale interne markt. Van de voorgestelde 9,2 miljard euro voor het aanleggen van een Europees breedband-netwerk heeft commissaris Kroes maar 1 miljard mogen houden. Daar is ze ‘boos en verdrietig over’ en ten tijde van de onderhandelingen zei ze tegen premier Rutte: ‘Mark, wat flik je me nou!’ Geen medium dat het oppikte. Helaas zijn er nog vele andere actuele thema’s, die Nederlandse media grotendeels missen. Zo maar een greep uit de agenda, houdt u vast. Er komen richtlijnen over versteviging van de interne markt. Het opzetten van een bankenunie voor de 6000 banken in de EU is van start (en loopt tegen allerlei problemen aan). Dit voorjaar besluit het EP over hervorming en vergroening van het landbouwbeleid. Vanaf 2014 gaat een miljardenprogramma de nationale infrastructuren beter op elkaar aansluiten. De Europese diplomatieke dienst wordt uitgebouwd. Het mandaat voor de Europese Centrale Bank wordt aangepast. Richtlijnen voor cybersecurity en bescherming van persoonlijke data volgen. Er komt verbetering van wetgeving voor chemische producten. In juli treedt Kroatië als 28ste lidstaat toe. De eurozone wordt verder uitgebreid. Lidstaten steggelen over de invoering van een financiële transactiebelasting. De Schengen-zone wordt verbeterd en herzien. De Commissie formuleert nieuwe doelstellingen voor het Europese klimaatbeleid tot 2030. Lidstaten moeten de Roma minderheden beter beschermen. Het Europese Emissiehandel Systeem staat op instorten, en er zijn DNA-testen ingevoerd om de paardenvleescrisis te beteugelen. Hallo, bent u daar nog? Ja? Welkom in het politieke Europa. Het gebrek aan aandacht voor EU is voor mij een dagelijkse realiteit. Ik moet er namelijk van leven. Na een aantal boeken en een reeks essays, interviews en andere publicaties over de EU, leek me eind 2012 de tijd rijp om mijn specialisatie in het hol van de leeuw te verdiepen. Enerzijds als journalist maar ook als oprichter van een nieuwe jongerendenktank, The Next Generation for Europe. Voordat ik naar Brussel vertrok maakte ik een rondgang langs redacties, om te kijken of ik voor hen Europees nieuws kon leveren. Veel kranten en tv-programma’s hebben geen vaste correspondent in de EU-hoofdstad, dus dat leek me een mooie opening. Maar meestal kreeg ik het lid op de neus, als ik al een reactie kreeg. ‘We doen het allemaal vanuit Hilversum,’ kreeg ik een keer te horen. ‘Ja, we zijn blind voor wat er gebeurt in Brussel, maar de hoofdredactie heeft er geen zin in,’ zei een andere redacteur. Mijn ervaring bij De Pers – ik was daar in 2007 politiek redacteur – leek zich te herhalen. Ook in die tijd gingen de ogen van mijn collega’s rollen, als ik over nieuws uit/over Brussel begon. Sinds ik hier daadwerkelijk zit lijken mijn nieuwsideeën steevast in een zwart gat te verdwijnen. Ondanks aanmoedigingen van een nieuwsdienst dat zij ‘heel graag Europese verhalen’ wilden hebben. En ondanks het zorgvuldig vermijden van de valkuil om het nieuws over die saaie instituten te laten gaan. Telkens weer sneed ik mijn voorstellen toe op wat het nieuws betekende voor Nederlandse burgers en bedrijven. Zo werd in februari een Europese standaard voor het rijbewijs ingevoerd, wat voor Nederland niet zo veel effect heeft omdat we die standaard (plastic creditcardformaat) al hanteren. Maar voor Nederlandse jongeren met motoraspiraties heeft het nieuwe rijbewijs wel degelijk gevolgen: zij kunnen nu pas vanaf hun 21ste een motorrijbewijs krijgen. Geen enkel medium wilde dit nieuws hebben. Er waren nog een reeks andere verhalen die ik niet kwijt kon, waar ik eentje uit wil pikken: de oplopende arbeidstekorten in de ICT-sector. Van bronnen binnen de Commissie hoorde ik dat zij begin maart bekend zouden maken dat het tekort zal oplopen naar liefst 900.000 personen in 2015. Personeelstekorten in tijden van crisis? Nieuws! Mismatch van vraag en aanbod dus. Het tekort was al bekend, maar eerder geschat op 700.000 onvervulde vacatures. Nieuws! En Nederlandse bedrijven worstelen ook met deze tekorten. Nieuws! Dit onderwerp leek me heel geschikt voor een mooie reportage en ik kreeg een interview met Neelie Kroes toegezegd. Zij heeft de afgelopen maanden tientallen multinationals min of meer gesmeekt om trainingen, stages en andere maatregelen te treffen om het tekort in 2020 weg te kunnen werken. En die toezeggingen zijn heel serieus: het gaat soms om trainingen voor honderdduizenden mensen. Maar uiteindelijk wilde geen enkel medium dit verhaal hebben. ‘Wat vage afspraken met bedrijven, daar gaan we niks mee doen,’ was de droge analyse. Deze situatie is natuurlijk niet zo leuk voor mij, want ik kan zo geen geld verdienen. Maar zij is vooral ronduit exemplarisch voor de desinteresse vanuit de Nederlandse pers als het gaat om de EU. In plaats van Brusselse tegels te lichten laat de journalistiek ze vooral liggen. Met de Nederlandse correspondenten hier kun je hooguit één schoolklas vullen, terwijl op het Binnenhof honderden journalisten actief zijn. Ter vergelijking: Brussel heeft na Washington het hoogste aantal geaccrediteerde journalisten ter wereld, in het vorig decennium zelfs tweeduizend. Alleen kwaliteitskranten als NRC Handelsblad, Trouw en het Financieele Dagblad hebben twee correspondenten met standplaats Brussel; die van het Algemeen Dagblad is uit bezuinigingsoverwegingen naar Rotterdam teruggehaald. RTL Nieuws heeft hier niemand in dienst. Letterlijk stelde de Haagse RTL-redacteur Jos Heymans in 2012: ‘Brussel is best vanuit Den Haag te volgen.’ Alleen voor de toppen gaan hij en zijn collega’s op en neer. Behalve dat de verslaggeving door de geringe personele inzet beperkt kan plaatsvinden, is zij ook ondermaats. Onlangs kopte De Telegraaf dat Brussel een heuse ‘spion’ zou inzetten om de Nederlandse regering te controleren. Terwijl het in werkelijkheid ging om een extra beleidsmedewerker voor het kantoor van de Europese Commissie in Den Haag. Deze fonctionnaire gaat alleen maar rapporteren over het Nederlandse economiebeleid. Maar de Telegraaf zag het anders en gaf de PVV een voorzet door om een reactie te vragen. En Wilders kopte hem makkelijk in: ‘stuur de spion met pek en veren terug naar Wallonië’ (sic). Ook het Financieele Dagblad kwam met een dergelijk bericht. In april mochten we met de Nederlandse correspondenten langs bij het kantoor van Kroes, voor een glaasje wijn en een toelichting op haar beleid. Ik ontlokte haar de uitspraak dat ze roaming – het betalen voor mobiel bellen buiten Nederland – wil afschaffen. Compleet. ‘Het heeft mijn hoogste prioriteit.’ Dat is echt belangrijk nieuws, maar wat zag ik de volgende dag in de krant? ‘Kroes mogelijk verder met derde termijn.’ Een van de correspondenten vroeg haar of ze een derde termijn uitsloot, na de EP-verkiezingen van 2014. Dat sloot ze niet uit = nieuws. De berichtgeving schiet dus tekort – en het is zoeken naar een complete verklaring hiervoor. Misschien hebben Nederlanders gewoon weinig met de EU, wil de politiek er niks van weten, of ligt het in de Nederlandse aard om te navelstaren. Maar voorbij deze borrelpraat kunnen wel degelijk een aantal structurele oorzaken identificeren. Oorzaken die in meer of mindere mate ook geldig zijn voor andere EU-lidstaten. Allereerst gaat het erg slecht met de journalistiek. Kranten- en magazinelezers haken de laatste jaren massaal af, advertentie-inkomsten lopen sterk terug, budgetten voor publieke radio en tv worden gekort. Daardoor komt het hele business model van de journalistiek op het spel te staan. Zie de teloorgang van Newsweek in de VS, maar ook de voortgaande discussie over het al dan niet betalen van het lezen van online artikelen. Een belangrijk gevolg hiervan is dat het dure correspondentschap wordt geschrapt. Veel media in binnen- en buitenland verkleinen hun correspondentencorps, geven ze minder geld of betalen ze uit als freelancer. Mede daardoor loopt het aantal journalisten sterk terug in Brussel: van de meer dan tweeduizend in 2005 tot zo’n 750 geaccrediteerden nu. Ten tweede is de werkdruk van de correspondenten hier gigantisch. Van de Nederlandse collega’s heb ik geen goed beeld, maar van anderen hoor ik dat ze zich een slag in de rondte moeten werken. En dat gaat weer ten koste van de kwaliteit, zoals de Britse journalist Nick Davies heel mooi schreef in zijn boek Flat Earth News (2010). Kleinere redacties die content moeten produceren worden afhankelijk van PR-bureaus en nieuwsagentschappen, is zijn betoog. Voor een ingewikkelde wereld als de EU is dat geen goed nieuws; journalisten die snel verhalen moeten schrijven zijn kwetsbaar voor beïnvloeding – spinning – door handige woordvoerders en lobbyisten. De beleidswereld die de EU heet, staat hier haaks op. Hij is complex, traag, soms ronduit ondoorgrondelijk met al die duizenden amendementen per wetsvoorstel. Ik schrijf deze regels in een sjiek gebouw van een denktank, omringd door saaie beleidsmakers, terwijl ik zometeen naar een presentatie over the prospects for economic convergence in the eurozone luister. Dat is Brussel: een stad van bureaucraten. Intussen gaat het hier wel over de toekomst van Europa. Hier rapporteren betekent aan de lopende band (nachtenlange) vergaderingen afwachten, naar technical briefings gaan, vele persconferenties, congressen en seminars bezoeken, en eindeloos veel koffie (en bier) drinken. Voor snelle journalistiek is hier geen plaats. Andere journalisten onderschrijven dit beeld van complexiteit. ‘Het probleem is niet te weinig, maar te veel informatie,’ klaagde een collega van de Financial Times. Zijn blackberry werd overspoeld met berichten terwijl we een lait russe dronken – de FT is veruit de belangrijkste nieuwsbron in Brussel. Een Deense collega stelde dat het ongeveer een jaar duurt voordat nieuwe journalisten hier hun weg weten en zich door de informatiestromen kunnen worstelen. Ik heb me inmiddels al beperkt tot een paar onderwerpen van de Europese nieuwsagenda. ‘Specialiseren in de EU’ klinkt achteraf enigszins overmoedig. Dus vanwege bezuinigingen, de werkdruk, de complexiteit en het ongrijpbare nieuwsmoment schort het aan de berichtgeving over de EU. De gevolgen hiervan worden langzaam maar zeker zichtbaar. Zo zijn de Europese instituten begonnen met een structurele tegenaanval. Als journalisten geen tijd meer hebben om stukken te lezen, filteren wij het nieuws voor ze, is de gedachte. Elke dag stroomt mijn mailbox vol met persberichten, quotes van Commissarissen, en op Twitter word ik doodgegooid met berichten van officiële woordvoerders. Zij willen héél graag mijn aandacht en die van andere journalisten, en gebruiken daarvoor grote getallen en feiten. Hoe vaak heb ik al niet gehoord dat een maatregel zoveel miljoen extra banen oplevert, of nulpuntnogwat procent groei mogelijk maakt, of tot miljarden aan extra investeringen leidt? Panklare feiten die je zo in een kop of het begin van een nieuwsbericht kan zetten. Verder krijgen de vertegenwoordigingen in de lidstaten extra bemanning. Niet zozeer met spionnen maar vooral met experts in sociale media, om de EU zichtbaarder te krijgen op Facebook, Twitter en andere online platforms. Het is immers het Europese jaar van de burger! Maar dat wist u waarschijnlijk niet. Ook zijn freelancers in dienst die helpen om de ingewikkelde zaken te versimpelen en ze vervolgens op de juiste media af te vuren. Van de vertegenwoordiging krijg ik wekelijks heel duidelijke press packs waarin per onderwerp precies staat uitgelegd wat het Europees Parlement allemaal behandelt, en wat de besluiten kunnen betekenen voor Nederlanders. Niet in de Europese bureaucratische taal maar in journalistentaal die zo gebruikt kan worden in nieuwsberichtjes. Zo vielen in maart van het Parlement de volgende berichten in mijn inbox: ‘EP wil groener landbouwbeleid gericht op voedselzekerheid’, ‘Snel een schadevergoeding voor teleurgestelde klanten’, ‘Parlement eist actie tegen hormoonverstorende chemicaliën’. Deze operatie-voorkauw lijkt me nuttig en verstandig, maar is toch ook zorgelijk voor de positie van het Europa-debat in Nederland. Als we zo structureel ondergeïnformeerd worden, kunnen we dan wel een behoorlijk standpunt over de Unie formuleren? Het maakt daarbij niet uit of je nu burger of politicus bent, de EU is ten slotte een democratisch instituut. Weet u bijvoorbeeld wat Commissaris Kroes doet? Of wie de Nederlandse Europarlementariërs zijn? In dat licht moeten we ook de discussie over een nieuw Europees referendum bezien, die in maart vrij hevig woedde. Er zou een nieuw verdrag komen en er zoueen continue overdracht van macht naar Brussel plaatsvinden. Volgens deze critici van het ‘EU Burgerforum’ zou de Unie vanaf het begin zijn opgezet als een complot, met sluipende machtsoverdracht naar een superstaat. Het stoorde me hoe weinig moeite journalisten en commentatoren namen om de argumenten van deze Gideonsbende van het ‘EU Burgerforum’ te ontkrachten. Sterker nog, ze kwamen overal aan tafel en kregen alle ruimte om eens een flink kritisch geluid over Brussel los te laten. Intussen heeft het EU Burgerforum meer dan 55.000 handtekeningen voor een referendum tegen een politiekere Unie binnengehaald. En zo krijgt Europa aandacht in de pers: door flink op de trom te slaan. Maar het is niet de aandacht die het Europese project verdient. Ik bepleit niet meer dan een serieuze, volwaardige en diepgravende journalistiek om de goede en slechte stappen van de beleidsmakers in Brussel te volgen. Bezuinigingen, problemen met framing of complexiteit mogen daarvoor geen excuses zijn. De journalistiek heeft een plicht om mensen te informeren over zaken die mensen raken, ook als ze in een ver Brussel worden bekokstooft en het gevoel van betrokkenheid ontbreekt. Een volksraadpleging over Europa is zinnig, mits het initiatief niet door populisme is geïnfecteerd. Op een zonnige meidag in 2005 liep toenmalig premier Balkenende over het Plein in Den Haag. Terwijl de camera’s zoemden, drukte hij een folder over het Europees Grondwettelijk Verdrag in de handen van een paar terrasgangers. Het waren ambtenaren die meewerkten aan de campagne en verbouwereerd hun eigen folder in ontvangst namen, met de oproep van de premier om hem vooral te lezen. Ik werkte destijds voor de EU-afdeling van Buitenlandse Zaken, en het stoom kwam bij veel diplomaten uit de oren. ‘Moeten we maar overal les gaan geven over hoe de EU in elkaar zit?’ vroegen ze zich af. Want ze zagen maar al te goed hoe de Nederlandse politici niet in staat bleken om het werkelijke verhaal over Europa te vertellen. Met dreigementen als ‘het licht gaat uit’ als de burger nee zou stemmen tegen de Europese Grondwet, verloor het ja-kamp onvermijdelijk. 62 procent van de Nederlandse burgers verwees in juni 2005 dit ontwerpverdrag naar de Europese prullenbak. Het is in dit licht dat in Nederland de discussie oplaait over een tweede referendum over de EU. Kleine complicatie: er ís nog helemaal geen nieuw verdrag. Sterker nog: de signalen die ik hier in Brussel opvang, zijn dat de onderhandelingen over zo’n nieuwe structuur voor Europa nog jaren gaan duren. Maar toch nemen politici, wetenschappers en commentatoren alvast een voorschot: áls er zo’n verdrag komt dan moet de Nederlandse bevolking zich daar rechtstreeks over kunnen uitspreken. De laatste in de rij die dit stelt, is PvdA-leider Diederik Samsom. Onlangs zette hij hier een boom over op – met het voorbehoud dat het een raadgevend referendum zou moeten zijn, en dat het geen simpelweg ja-nee-schema mocht worden. De keuze van Samsom is verstandig – en de timing ook. En wel om de volgende redenen. Ten eerste grijpt de Europese Unie steeds dieper in op het nationale niveau. Zoals ik vorig jaar schreef in mijn boek De machteloze staat is de verhouding tussen natiestaat en EU inmiddels volledig zoek. Veel meer dan mensen beseffen, is de centrumpositie van het Binnenhof als bestuursplek aan erosie onderhevig. Het is daarom essentieel dat de bevolking zich te zijner tijd direct mag uitspreken over een nieuwe stap in het Europese integratieproces. Verder is het instrument van een referendum, raadgevend of niet, een noodzakelijk paardenmiddel als het gaat om Europa. De ervaring uit 2005 was een prachtige, los van de uitkomst. Nog nooit is er zo’n fel, open en inhoudelijk debat over Nederland en Europa gevoerd. Werkelijk op alle niveaus in de samenleving spraken in de campagnetijd mensen met elkaar over de voor- en nadelen van de EU. Daarna is de betrokkenheid van ‘de burger’ weer als een kaartenhuis in elkaar gezakt en was Europa bij de laatste verkiezingen ook nauwelijks een thema. Kennelijk is alleen een volksraadpleging in staat om de EU werkelijk ‘te politiseren’. Beleidsinstrumenten als ‘subsidiariteit’ en ‘oranje kaarten’ zijn daar niet in geslaagd. Ten derde zullen in veel andere landen referenda over zo’n nieuw verdrag worden gehouden, van Ierland tot Spanje en van Frankrijk tot – uiteraard – Groot-Brittannië. Nederland mag deze boot niet missen. Het verkleint ook het risico op een politiek isolement, want de kans is groot dat één EU-lidstaat het nieuwe verdrag zal afwijzen. Wel stel ik een belangrijke voorwaarde aan een referendum. Dat moet alleen worden gehouden als de regeringsleiders er bij de onderhandelingen in slagen om een volwaardige politieke Unie op te zetten. Dan is de keuze heel helder. Willen we als Nederland deelnemen aan zo’n federaal Europa en onze bevoegdheden vergaand opgeven? Of kiezen we voor een positie in de ‘tweede ring’ van landen die niet diepgaand met elkaar willen integreren? Zo’n wezenlijk politiek debat over de toekomst van je land zou een historische mijlpaal zijn, maar dan moet die keus wel echt op tafel liggen. In deze context is een referendum over de toekomst van Nederland in Europa nuttig en noodzakelijk. Maar absoluut niet in de framing die de afgelopen weken is ontstaan, aangewakkerd door de Gideonsbende van Thierry Baudet. Deze recalcitrante neonationalist bracht een groep wetenschappers en publicisten bijeen om op hoge toon het referendum te eisen. Hun motivatie is volstrekt populistisch en volkomen onjuist. Zij vinden dat ‘het over en uit is met de liefde van de Nederlander voor de EU’. Erger nog, het is allemaal een Brussels complot: ‘De EU is zo opgezet dat er steeds nieuwe bevoegdheden moeten worden overgedragen om te kunnen blijven functioneren.’ Deze (semi-) wetenschappers betogen dat een ‘federaal pad ongewenst en onwerkbaar is, zelfs gevaarlijk’. Daarom moet het door hen opgerichte burgerforum een referendum afdwingen, eigenlijk om Nederland uit de klauwen van de EU te redden. Samsom heeft een verstandige koers, maar de popi-academici niet. En laten we nu beginnen met Nederlanders – burgers én politici – te informeren over wat er allemaal in Brussel gebeurt. Pas dan, en na eventuele verdragsonderhandelingen, moet het volk ook over de keuzen worden geraadpleegd. Joop Hazenberg is EU watcher en auteur van het boek De machteloze staat (2012).